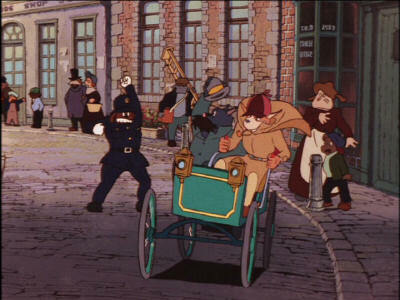 Ghibli Blog: Studio Ghibli, Animation and the Movies: Will Sherlock Hound Soon Go OOP? Will Sherlock Hound Soon Go OOP? I've been informed that Geneon will soon take their Sherlock Hound DVD's off the market. I send an email to the company asking for confirmation, but have yet to receive a response. Considering that the series was released in February, 2002, it wouldn't be surprising. I would suggest that until we learn otherwise, we should assume that Sherlock Hound will soon go out-of-print at the end of this month. As I wrote in an earlier post, the Telecom, Miyazaki-directed episodes appear on Sherlock Hound Case Files 1-3, so be sure to purchase those DVD's via your local retailer or Amazon. When I bought mine, I paid about $20 for each. The news has been floating around on several anime news sites, so I guess it can be taken as true. Gah, bad news. I hardly have any money at the mo, so I won't be able to afford them. I'll try atleast to get one of them.